I happened upon a new book this week. Well, it's not a new book; rather an old book that I had not heard of before. 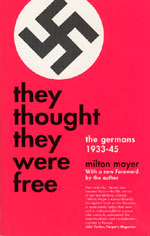 "They Thought They Were Free" by Milton Mayer discusses what happened in Germany before and during World War II, but from the point of view of the people of Germany. What no one seemed to notice," said a colleague of mine, a philologist, "was the ever widening gap, after 1933, between the government and the people. Just think how very wide this gap was to begin with, here in Germany. And it became always wider. You know, it doesn’t make people close to their government to be told that this is a people’s government, a true democracy, or to be enrolled in civilian defense, or even to vote. All this has little, really nothing, to do with knowing one is governing.